It remains a source of amazement and amusement to me that some people still believe that the earth is flat. From what I can tell this is only a very small minority of folks. Some of them are obvious trolls. Others believe everything is a conspiracy. Still others are just low IQ people with an extremely limited grasp of science and logic. Some think that being contrary by definition means being smart. Others flatter themselves that they're just smarter than everyone else. And some are people who reject all science, logic and math as Eurocentric and thus by definition untrue and racist. So it goes. 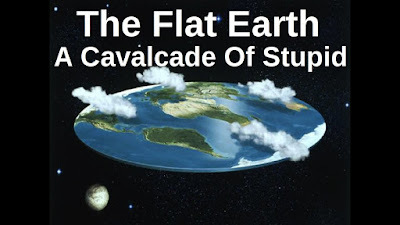 But it's funny to me that when the evidence conclusively disproves the flat earth theory, flat earth adherents drop the evidence and not the theory. One of those Flat Earthers is Bob Knodel, who hosts a YouTube channel entirely dedicated to the theory and who is one of the team relying on a $20,000 laser gyroscope to prove the Earth doesn't actually rotate. Except... It does.